← Pinot Noir, The Princess and the Peasant, Signal Ridge Vineyard, Alexander Valley, Sonoma, California, 2014, 13.9% abv. What exactly is Monastrell? In France it’s called Mourvèdre, and in Australia, Mataro. In those two countries, the grape is part the common blend called GSM (Grenache, Syrah, Mourvèdre) with each of the grapes bringing something special to the blend. These days, Monastrell is often made into wine on its own in Spain, although historically it was far more likely to be used for blending to deepen a wine with its dark colour and strong tannins. 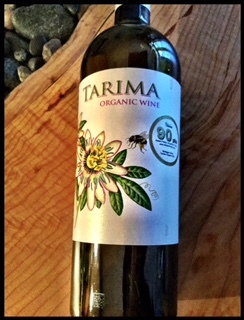 This wine is ‘organic’, but that only means the grapes used are grown according to organic standards. Don’t mistake this with a biodynamic wine which has to be grown and made according even more demanding standards. On the eyes, it’s a dense, deep purple with even legs. The nose is a little hot and shows aromas of dark berries, cinnamon, cigar box and wet earth. The palate is dry with average acidity and tiny, tamed tannins; these were not the tannins I was expecting! Flavours include more of the nose – mulberry, dark chocolate, baking spice, tobacco and earth. The alcohol is high on this but that’s common for Monastrell. The back of the palate fades quickly, but this is wine and it’s doing its winey job. WSET Good – and would be happily paired with Thanksgiving burgers on the BBQ. This entry was posted in Mouvedre, Monastrell, RED, Spain and tagged Alicante DO, Monastrell, mourvedre, organic, organic grapes, spain, Tarima. Bookmark the permalink.